Wonderful Words Wednesday: Happy “Dord” Day! It’s Wonderful Words Wednesday at the River Houses! On this day in 1939, an editor working on the third edition of Webster’s New International Dictionary was examining the second edition (1934) to see what entries should be updated. He came across the word “dord,” a synonym (according to the dictionary) for the word “density” as used in physics and chemistry. The word had no associated etymology, so the editor decided to investigate. The definition of ‘dord’ as it appeared in Websters New International Dictionary (1934). In later editions, after it had been spotted, the error was removed, leaving the dictionary more accurate, but less entertaining. A little lesson for your homeschool students: dictionaries are compiled by people just like you and me, and even though they try very hard to be accurate, sometimes they make mistakes just like we do. ❡ Explore more: The delightful Fun With Words website (fun-with-words.com) has the full story of “dord,” along with a lot of other wild and wonderful words to explore. Tuesday is Books & Libraries Day at the River Houses. 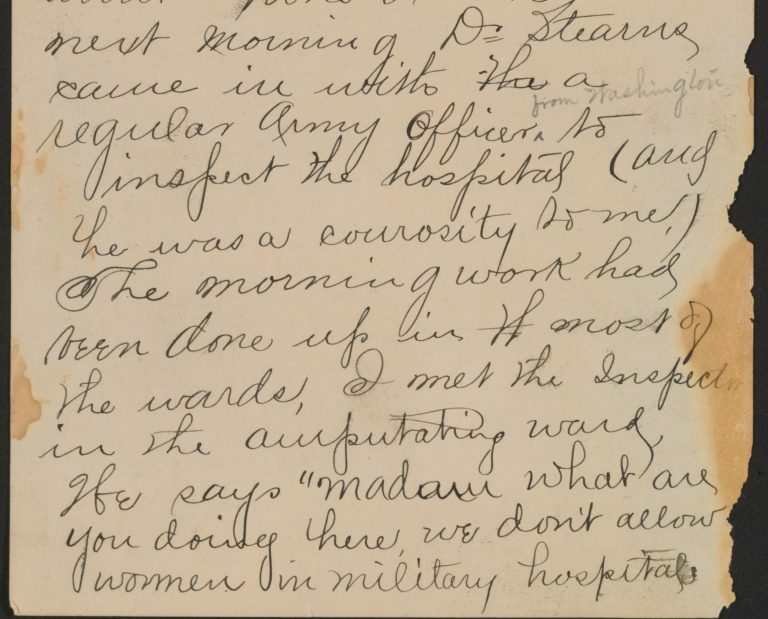 This week: helping students learn the value of primary sources in research. The Library of Congress has some excellent teaching tips and educational resources available on its website — all of them suitable for homeschoolers — and this week they are featuring a Civil War memoir as an example of a primary research source. If you have students working at the high school level, this is an excellent topic to cover with them. You can read about the memoir’s context, and view the entire scanned document in high resolution, at that link. Spend a few homeschool minutes this week examining these primary sources with your students and talking about the difference between primary sources, such as the Bickerdyke memoir, and secondary sources, which represent the summarized, narrated, interpreted views of later historians. What educational discoveries have you made at your library lately? Monday is Museums & Monuments Day at the River Houses: spend a few homeschool minutes exploring a notable cultural or historical site somewhere in the world and broaden your homeschool horizons. You don’t have to be exhaustive: just look up its location your atlas (riverhouses.org/books), learn a new name or a new date, and your little lesson is done. Over the course of the year, almost without realizing it, you and your students will absorb a wealth of new cultural, historical, and geographical information. 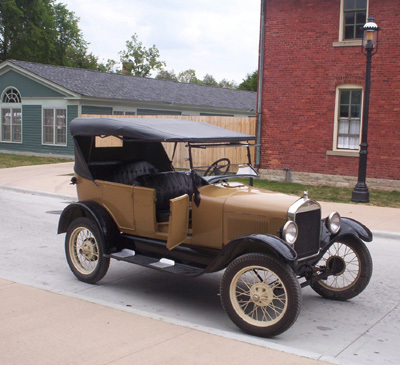 The Ford Museum is part of a much larger indoor and outdoor museum complex, known simply as “The Henry Ford,” that includes Greenfield Village (an extensive outdoor living history museum) and the Ford Rouge Factory (a working automobile factory). The Ford Museum itself includes a vast array of exhibits on technology and manufacturing, agriculture, historic inventions, American history, and of course, automobiles. In the years since it opened in 1933, the Ford Museum has acquired many important items that illustrate America’s history of innovation, including Thomas Edison’s laboratory, the Wright Brothers’ bicycle shop where their first “flying machine” was designed, and more. It’s one of the largest and most-visited museum complexes in the United States. Spend a few homeschool minutes exploring the Henry Ford Museum online with your students this week, and maybe planning an in-person visit for the future. ❡ Explore more: Your River Houses history encyclopedia (riverhouses.org/books) has a feature on the “Shrinking World” that has come about through increasing ease of travel (pages 486–487), and it includes a box on Henry Ford and his role in the mass production of automobiles in the early twentieth century — it’s just the thing to get a wonderful homeschool conversation started. 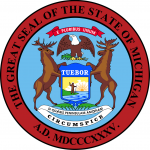 MICHIGAN (the 26th state, 26 January 1837) — The Great Lakes State, the Wolverine State. Capital: Lansing. Michigan appears on pages 575–576 in your almanac, and on plates 41 and 142 in your atlas. Name origin: “From Chippewa mici gama, meaning ‘great water,’ after lake of the same name” (almanac page 423, in telegraphic style). State bird: American Robin. Website: www.michigan.gov. ❡ Explore more: If you’re planning a comprehensive unit study of one or more the U.S. states, be sure to investigate the excellent State Resource Guides available from the Library of Congress (www.loc.gov/rr/program/bib/states). These guides list a wide range of materials on all the U.S. states and territories, and the bibliographies accompanying each guide include a special selection of items for younger readers. 🇱🇹 LITHUANIA in Eastern Europe. Population: 2,823,859. Capital: Vilnius. Website (in Lithuanian): lrvk.lrv.lt. 🇱🇺 LUXEMBOURG in Western Europe. Population: 594,130. Capital: Luxembourg. Website (in French, German, English, and Luxembourgish): www.gouvernement.lu. 🇲🇰 MACEDONIA in southeastern Europe. Population: 2,103,721. Capital: Skopje. Website (in Macedonian): www.vlada.mk. 🇲🇬 MADAGASCAR in the Indian Ocean off the coast of Africa. Population: 25,054,161. Capital: Antananarivo. Website (in French, English, and Malagasy): www.primature.gov.mg. These all appear in your current almanac, atlas, and history encyclopedia as well. For example, you’ll find the main entries for the Indian Ocean country of Madagascar on almanac page 801, atlas plates 135 and 100 (where you can practice reading insets on a map), and history encyclopedia page 567, with illustrations, flags, and other mentions available through the indexes in each volume. QUICK FRESHES are our regular Sunday notes on the homeschool week ahead. Pick one or two (or more!) of the items below and use them to enrich your homeschooling schedule! ❡ Little lessons: “Did you know that the tiny European nation of Luxembourg isn’t really a ‘state’ or a ‘republic’ or a ‘kingdom,’ but is actually a Grand Duchy headed by a Grand Duke?” You can find a facts-and-figures outline of Luxembourg on page 800 in your River Houses almanac and on plate 135 in your River Houses atlas, with a map of the country (look close!) on atlas plate 63 (riverhouses.org/books). 🌔 THE MOON at the beginning of this week is waxing gibbous — a relatively good time for moonwatching but an increasingly poor time for stargazing as the moon approaches full (on 1 March). Track the moon’s phases each month at timeanddate.com/moon/phases, and dial up this week’s constellations with your River Houses star atlas (riverhouses.org/books). 🗓 TODAY (Sunday, 25 February) — Today is the 56th day of 2018; there are 309 days remaining in the year. Learn more about different kinds of modern and historical calendars on pages 351–357 in your River Houses almanac (riverhouses.org/books). ⬩ Today is also the birthday of the great French painter and sculptor Pierre-Auguste Renoir, born 25 February 1841. ⬩ On this day in 1870, Hiram Rhodes Revels, a Republican from Mississippi, was sworn in as the country’s first African American senator. Monday (26 February) — Monday is Museums & Monuments Day at the River Houses. Since Michigan is our state-of-the-week, we’re going to pay a virtual visit to the Henry Ford Museum in Dearborn, Michigan. ⬩ Monday is also the birthday of German-American dry goods manufacturer Levi Strauss, born 26 February 1829, whose name is now synonymous with one of most popular articles of clothing in the world. Tuesday (27 February) — Join us for Tuesday Tea at the Library and some notes on books, libraries, and history. Wednesday (28 February) — Wednesday is Wonderful Words Day at the River Houses. This week, a mystery: do you know what “dord” is? Thursday (1 March) — Thursday is the birthday of the great Polish composer and pianist Frédéric Chopin, born 1 March 1810. ⬩ It’s also the birthday of the great American sculptor Augustus Saint-Gaudens, born 1 March 1848. Friday (2 March) — Since this is the first Friday of the month, our regular Friday Field & Nature Notes will preview the astronomical events your homeschool students can be on the lookout for over the next few weeks. Saturday (3 March) — Saturday is Arts & Music Day at the River Houses. In honor of Chopin’s birthday on Thursday, we’ll spend a few minutes listening to some of his most famous piano works. 🌎 EVERYTHING FLOWS: Madagascar is one of our countries-of-the-week, so our Weekly World River is the Ikopa River, which flows through Madagascar’s capital city of Antananarivo. You can chart its course in your River Houses atlas (riverhouses.org/books), and you can read more about it in the Ikopa River entry in Wikipedia or perhaps at your local library the next time you visit. Saturday is Arts & Music Day at the River Houses. This week, take a few homeschool minutes to learn about the great American painter Winslow Homer, born in Boston on 24 February 1836. Largely self-taught as an artist, Winslow Homer began his career as a young man in commercial illustration. As his skills developed he turned to oil and watercolor painting and went on to become one of the most prominent American painters of the nineteenth century. Best remembered for his seascapes and his depictions of rural life, he created a style and an aesthetic that we still think of as distinctly American. Take a few minutes to share Winslow Homer’s beautiful paintings with your homeschool students this week, and perhaps inspire them to become ever better artists themselves. Last weekend (16–19 February) was the weekend of the Great Backyard Bird Count (birdcount.org), a worldwide event sponsored by Cornell University and other organizations. The overall results are starting to be assembled, and they are impressive. At the half-way point in the data tabulation more than 80,000 individual bird checklists had been submitted, reporting observations of more than 5000 bird species around the world. “Ranked by number of species, India is outstripping everyone else with 730 species. Brazil follows with 707 species, then Colombia with 676, Mexico has 659, and the United States is next with 617 species” (gbbc.birdcount.org). One notable observation is that this has been a good Snowy Owl year for observers in the northern United States and even further south. Snowy Owls are an irruptive species, and their winter distribution is affected by the annual population of voles — their main prey — in far northern regions. In years when the vole population is low, Snowy Owls move further south in the winter, and this appears to be just such a year. 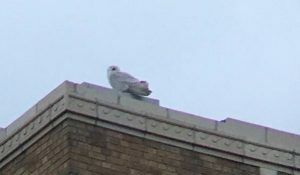 One stray owl even appeared on top of a government building in Washington, D.C., well to the south of its usual winter range. One of our long-term goals for the River Houses network is to have a collection of educational group projects that members can work on together, wherever they may be across the country. As time goes on, we hope that the Great Backyard Bird Count will become one of those projects. It’s Wonderful Words Wednesday at the River Houses. Tomorrow is George Washington’s birthday, so take a few homeschool minutes this week and read (aloud if you can) a few lines from one of Washington’s most famous — and most critical and consequential — addresses. 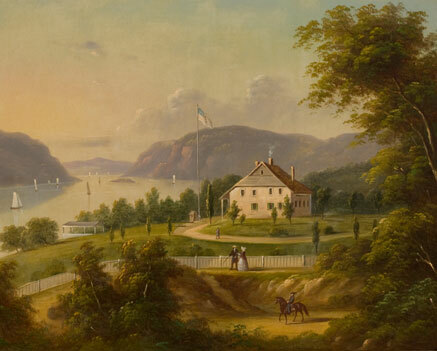 The scene was the army encampment in Newburgh, New York, on 15 March 1783. The Revolution had ended — Cornwallis had surrendered at Yorktown almost a year and a half before — but the army had not yet been disbanded because the final peace treaty with Britain had not yet been signed, and most significantly, the army had not yet been paid. Armies are by nature dangerous, and armies that have fought and sacrificed and then haven’t been paid for their service are especially dangerous. At Newburgh in March 1783, Washington faced an incipient mutiny, with thinly veiled anonymous threats circulating among the officer corps suggesting that a military takeover of the Congress might be necessary. George Washington put down the uprising, not with force, but with words. His “Newburgh Address” of 15 March 1783 is a critical document of the Revolutionary period, and it may well have saved the young republic from descending into military dictatorship. By an anonymous summons, an attempt has been made to convene you together — how inconsistent with the rules of propriety! how unmilitary! and how subversive of all order and discipline — let the good sense of the Army decide. In the moment of this summons, another anonymous production was sent into circulation, addressed more to the feelings & passions, than to the reason & judgment of the Army…. That the Address is drawn with great art, and is designed to answer the most insidious purposes; That it is calculated to impress the Mind, with an idea of premeditated injustice in the Sovereign power of the United States, and rouse all those resentments which must unavoidably flow from such a belief; That the secret Mover of this Scheme (whoever he may be) intended to take advantage of the passions, while they were warmed by the recollection of past distresses, without giving time for cool, deliberative thinking, & that composure of Mind which is so necessary to give dignity & stability to measures, is rendered too obvious, by the mode of conducting the business…. For myself … [I will] declare, in this public & solemn manner, that, in the attainment of compleat justice for all your toils & dangers, and in the gratification of every wish, so far as may be done consistently with the great duty I owe my Country, and those powers we are bound to respect, you may freely command my services to the utmost of my abilities. While I give you these assurances, and pledge my self in the most unequivocal manner, to exert whatever ability I am possesed of, in your favor — let me entreat you, Gentlemen, on your part, not to take any measures, which, viewed in the calm light of reason, will lessen the dignity, & sully the glory you have hitherto maintained…. It’s Tuesday Tea at the Library! We live in a truly fortunate age, when a young student can sit at home and examine up close some of the rarest and most important books in history — books that a few years ago would have been accessible only to scholars in the world’s largest libraries. Monday of this week was the birthday of the great Polish scholar and scientist Nicholas Copernicus (1473–1543), and today on our virtual library visit we’re going to look at an exceptionally fine copy of Copernicus’ most famous book, De Revolutionibus Orbium Coelestium (On the Revolutions of the Celestial Spheres), first published in 1543 in Nuremberg, in what is now Germany. “De Rev” (as history of science geeks call it) is one of the most important books ever published because it laid out a comprehensive sun-centered or heliocentric picture of the solar system, to replace the earlier earth-centered or geocentric picture. If you have some serious science students in your homeschool, introduce them this week to Nicolaus Copernicus and how he changed our understanding of the world. ❡ Explore more: For a quick review of the Renaissance, the historical period in which Copernicus lived, turn to pages 250–253 in your River Houses history encyclopedia (riverhouses.org/books), and for an overview of the Scientific Revolution that he helped to spark see pages 266–267. Monday is Museums & Monuments Day at the River Houses: spend a few minutes exploring an important cultural or historical site online and broaden your homeschool horizons. Don’t worry about being comprehensive: just find its location your atlas (riverhouses.org/books), learn a new name, a new date, or a new word or two, and your little lesson is done. Over the course of the year, almost without realizing it, your students will absorb a wealth of new cultural, historical, and geographical information — and so will you! Nicolas Copernicus is one of the most fascinating personages of the Renaissance. He was principally known for his heliocentric theory, which gave modern views of the structure of the Universe their start. Today, Copernicus’ theory that the Earth is not the center of the Universe but along with all the other planets circles around the Sun is considered to be quite obvious. However, at the time the theory was voiced, it was a revolutionary view and greatly influenced all natural and philosophical sciences. Today on his birthday, remember with your students the life of this great “Renaissance man,” Nicolaus Copernicus. ❡ Explore more: Your River Houses history encyclopedia (riverhouses.org/books) has a beautifully illustrated overview of the historical period known as the Renaissance on pages 250–253, including a mention of Copernicus and his significance — just the background you need for a wonderful homeschool history lesson. 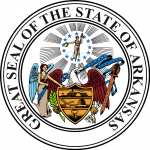 ARKANSAS (the 25th state, 15 June 1836) — The Razorback State. Capital: Little Rock. Arkansas appears on pages 565–566 in your almanac, and on plates 40 and 142 in your atlas. Name origin: “Algonquin name for Quapaw Indians, meaning ‘south wind’” (almanac page 423). State bird: Northern Mockingbird. Website: www.arkansas.gov. ❡ Little lessons: You can teach a hundred little lessons with the state-of-the-week, using your reference library (riverhouses.org/books) as a starting point. Find the location of the state capital in your atlas. Look up the state bird in your bird guide. Read the almanac’s one-paragraph history aloud each week. Using each state’s official website (above), find and copy the preamble to that state’s constitution into a commonplace book over the course of the year. Practice math skills by graphing each state’s population and area. Look up the famous state residents listed in your almanac either online or at your local library. The possibilities are endless and they can be easily adapted to each student’s age and interests. Pick a simple pattern to follow each week, and by the end of the year, without even realizing it, your students will have absorbed a world of new geographical and historical information. 🇱🇸 LESOTHO in southern Africa. Population: 1,958,042. Capital: Maseru. Website (in English): www.gov.ls. 🇱🇷 LIBERIA on the coast of West Africa. Population: 4,689,021. Capital: Monrovia. Website (in English): emansion.gov.lr. 🇱🇾 LIBYA on the coast of North Africa. Population: 6,653,210. Capital: Tripoli. Website (in Arabic): pm.gov.ly. 🇱🇮 LIECHTENSTEIN in the Alps of Central Europe. Population: 38,244. Capital: Vaduz. Website (in German): www.liechtenstein.li. These all appear in your current almanac, atlas, and history encyclopedia as well. For example, you’ll find the main entries for the tiny nation of Liechtenstein on almanac pages 799–800, atlas plates 69 and 135, and history encyclopedia page 530, with illustrations, flags, and other mentions available through the indexes in each volume. ❡ Little lessons: “Did you know that the tiny European nation of Liechtenstein has a population of only 38,000?” You can find a facts-and-figures outline of Liechtenstein on page 796 in your River Houses almanac and on plate 135 in your River Houses atlas, with a map of the country (look close!) on atlas plate 69 (riverhouses.org/books). 🗓 TODAY (Sunday, 18 February) — Today is the 49th day of 2018; there are 316 days remaining in the year. Learn more about different kinds of modern and historical calendars on pages 351–357 in your almanac. ⬩ The Great Backyard Bird Count is underway! Read more at our GBBC post from last week. ⬩ Today is also the birthday of the great American stained glass artist Louis Comfort Tiffany, born 18 February 1848. Monday (19 February) — Monday is Museums & Monuments Day: take a few minutes to explore a new place and broaden your homeschool horizons. This Monday happens to be the birthday of one of the most famous scientists in history, Nicolaus Copernicus, born 19 February 1473, so we’ll pay a visit to the Nicolaus Copernicus Museum in his home town of Frombork, Poland. Tuesday (20 February) — Join us for Tuesday Tea at the Library and some notes on books, libraries, and history. This week, in honor of Copernicus’ birthday, we’ll take an educational look at one of the most famous books ever published: De Revolutionibus Orbium Coelestium (On the Revolutions of the Heavenly Spheres) (1543). Wednesday (21 February) — Wednesday is Wonderful Words Day at the River Houses. Since tomorrow is George Washington’s birthday, we’ll spend a few homeschool minutes today reading from one of Washington’s most famous addresses. ⬩ We’ll also mark a sad anniversary: on this day in 1918 the last Carolina Parakeet died in captivity in the Cincinnati Zoo. Thursday (22 February) — Today is George Washington’s birthday! (His real birthday, not the phony made-up “Presidents Day” holiday.) 😊 It’s also the birthday of the American poet James Russell Lowell, born 22 February 1819. Friday (23 February) — Our regular Friday Field & Nature Notes will take a look back at the last weekend’s Great Backyard Bird Count. ⬩ This Friday is also the traditionally recognized publication date of the Gutenberg Bible in 1455, the first Western book printed with movable type. Saturday (24 February) — Saturday is Music & Arts Day at the River Houses. Spend a few homeschool minutes today learning about the great American painter Winslow Homer, born 24 February 1836. 🌎 EVERYTHING FLOWS: Liechtenstein is one of our countries-of-the-week, so our Weekly World River is one of the great rivers of Europe, the Rhine, which forms the border between Liechtenstein and Switzerland. You can chart the Rhine’s course in your River Houses atlas (riverhouses.org/books), and you can read much more about it in the comprehensive Rhine entry in Wikipedia (or perhaps at your local library the next time you visit). Monday was Abraham Lincoln’s birthday, and next Monday is Presidents’ Day, so in this presidential season we’re going to listen to a famous work by the great American composer Aaron Copland (1900–1990). “Lincoln Portrait” was written in 1942 and scored for orchestra and narrator. The narration features quotations from Lincoln’s speeches and writings. If you teach your homeschool students only one constellation, teach them Orion the Hunter, high in the southern sky now every evening. Of all the constellations, none is quite as magnificent as Orion, “the most beautiful and imposing constellation in the heavens” according to your recommended River Houses star atlas (riverhouses.org/books). If your students learn to recognize Orion — shoulders, legs, belt, and sword — they will have a friend for life, and no matter where they go in the Northern Hemisphere, from the deserts of Arizona to the mountains of Siberia, Orion will watch over them every year. In mid-February, Orion is high in the south in the early evening, just right for extended viewing. The two bright stars that mark his shoulders carry the wonderful names Betelgeuse and Bellatrix; his legs are marked by Saiph and Rigel (see pages 18–19 in your star atlas). Betelgeuse is a red supergiant star, many times larger than our sun; Rigel is a blue-white supergiant. The famous Orion Nebula is visible to the naked eye if you’re viewing from a dark-sky location; it covers the middle of Orion’s sword. To the left of Orion you can see Sirius, the brightest of all the fixed stars, marking Orion’s faithful companion constellation Canis Major, the Big Dog. ❡ Watchers of the skies: Teaching your students to recognize the constellations is one of the simplest and most enduring gifts you can give them. The planisphere on the front of your River Houses star atlas (riverhouses.org/books) will let you dial up the northern hemisphere sky for any night of the year, and the descriptions and maps of each constellation will point out the highlights. Find a dark-sky spot near you this month and spend some quality homeschool time beneath the starry vault. 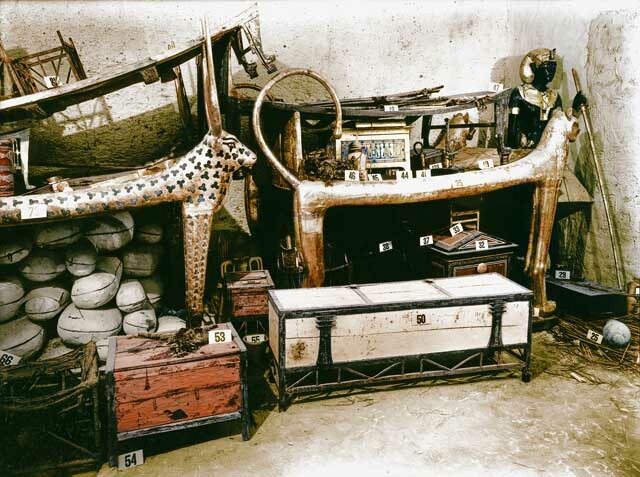 They have a wealth of academic and educational material available on Carter and “King Tut,” including the photographs taken as the tomb was being revealed for the first time, with all its contents just where they had been left 3000 years before.